This O-Ring splicing kit is made of Black Buna-N, has a durometer of 70A, and includes 5 pieces of o-ring cord in standard cross sections, 7 feet of cord per piece. The cord has a Round cross-section and can be used across a wide temperature range from -40 degrees F (-40 degrees C) to 212 degrees F (100 degrees C). 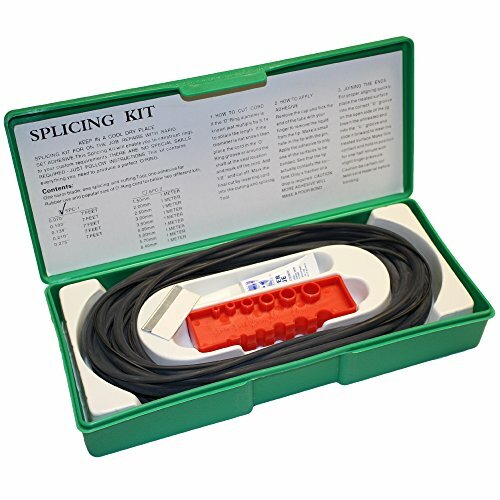 The splicing kit comes in a plastic box with lid card, instructions, cord stock, splicing jig, cutting tool, and adhesive. The kit includes the following cord sizes: 7 feet of 0.070", 0.103", 0.139", 0.210", and 0.275" O-Ring Cord Stock. Buna-nitrile can have high tensile strength, as well as abrasion, tear, and compression set resistance. It is compatible for use with petroleum, hexafluoroacetone (HFA), hexafluoro-2-butyne (HFB) and hydrofluorocarbon (HFC) fluids, vegetable oil, alcohol, acids, and aliphatic hydrocarbons. Buna-nitrile is vulnerable to acetone, ethers, esters, ozone, sunlight and weathering, and should not be used in ozone-generating electric motors, welding equipment, or in applications with exposure to UV light. The durometer hardness of this Buna-N O-Ring cord is 70A. Durometers measure the hardness of a material and its resistance to permanent indentation. A higher durometer value indicates greater resistance to indentation. On a scale of 0 to 100, a value of 0 indicates that a sample was completely penetrated, while a value of 100 shows no indentation in the sample. The letter following the number identifies the shore scale, which is either shore A or D. Shore A is used for rubber, while shore D is used for harder plastics.